We were quite taken by this yearling, prepared by the experienced team at Lustre Lodge. 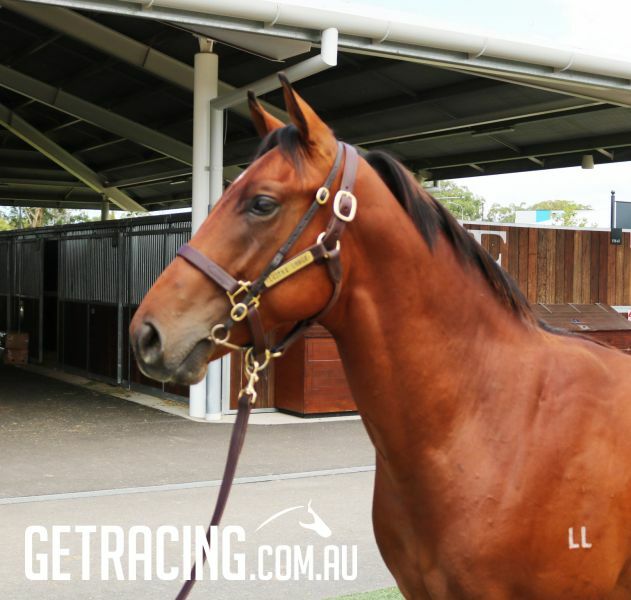 The Longmire twins from Goulburn, NSW are very excited to be given the opportunity to train this impressive thoroughbred and they played a major role in the selection of this colt. The colt is a fluent mover that oozes quality with the strength to match. He has loads of presence, lovely angles, strong shoulders and a big deep girth. He took everything in his stride during the sales and has a great temperament. The colt has all the makings of being an early running 2yo. 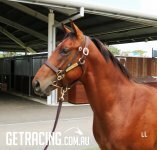 Emma and Lucy Longmire sales comments, “We are extremely excited to be working with Group One Thoroughbreds and this beautifully bred colt. He is power packed a lovely clean action and all the qualities of a genuine racehorse. He is athletic and strong with powerful hindquarters”. 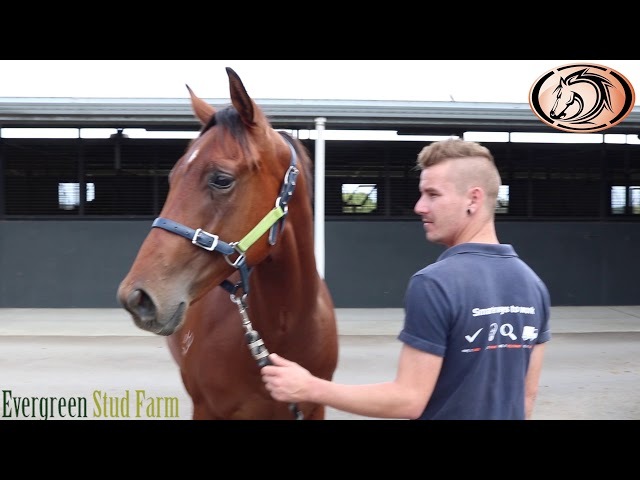 The colt has just completed being educated at Evergreen Stud by astute breaker Gordon Pratt, he reported on 12th April, “Just finishing breaking him in for Group One Thoroughbreds he broke in really well. He’s nice and strong and quite forward, the colt broke in easily which is good. He has a good head on him and handled everything really well. He will now head out to the paddock for a 4 week break, before returning and we will assess the options”. His Goldmine rating was high, this is based on similar breeding patterns on graded stakes winners. The colt is bred on the same crosses as 8 Group 1 winners including GUELPH, MIRACLES OF LIFE and REBEL DANE. ALIZEE 7 wins from 1100m to 1600m, ATC Flight S., Gr.1, Queen of the Turf S., Gr.1, Light Fingers S., Gr.2, Tea Rose S., Gr.2, Expressway S., Gr.2, Christmas Classic H., L, Everest is Coming H., 2d ATC Silver Shadow S., Gr.2, Magic Night S., Gr.3, 3d MRC Thousand Guineas, Gr.1, 4th ATC Vinery Stud S., Gr.1, NSW Tatt's RC Furious S., Gr.2. ASTERN 5 wins-3 at 2-to 1400m, ATC Golden Rose S., Gr.1, Silver Slipper S., Gr.2, Run to the Rose H., Gr.2, Kindergarten S., Gr.3, Surf Meets Turf 2YO P., 2d VRC Coolmore Stud S., Gr.1, ATC Roman Consul S., Gr.2. YOUR SONG by FASTNET ROCK has been described as the most dominate Group 1 winning son of Fastnet Rock. He was a runaway winner of the 2013 Group One BTC Cup by 5 lengths and the renowned wet tracker went early racing strongly as a 2YO. He genuinely stamps his stock and as a leading first season sire in Australia the future couldn’t be brighter as his progeny mature and progress with their racing careers. Your Song is generating a lot of hype on the race track with GEM SONG recently winning the Group 3 Eskimo Prince Stakes for the Kris Lees Stable. The 3YO gelding has won 4 races from 6 starts and looks to be a genuine stakes performer moving forward. His progeny announced themselves early as BRAVE SONG and SPLIT LIP won at stakes level and the 4YO’s look set to continue to showcase the bloodline. BREVITY is very well bred with a pedigree page littered with black type winners. She was lightly raced with only 5 starts, she was a winner over 1600m and had a minor placing. She is the daughter to multiple stakes performer ROSE DARMORE. Winner at 1200m, SAJC Irish Day August 22nd H., 2d SAJC Fulham Park 2YO P., Dermody BP Athol Park 2YO H., 3d MRC Blue Diamond Prelude (f), Gr.3, SAJC Laelia S., L, 4th SAJC Dequetteville S., L.
Emma and Lucy Longmire live for their horses. The identical twin sisters have recently formed a training partnership based in Goulburn, New South Wales. The Longmire's run a boutique stable where the horses come first and only the best of care is accepted. The Longmire's are hands on with their training and both know their roles in the day to day running of the stable. 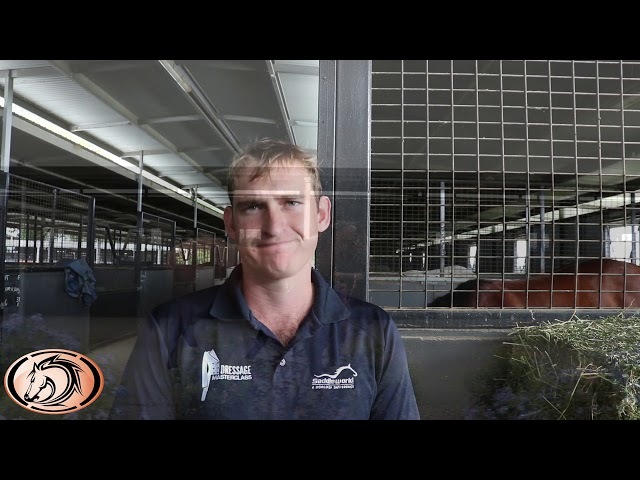 They ride their own track work which they believe is a significant advantage to many of the larger trainers as they can attain a good handle on where each horse is at during its preparation and identify any little differences between each galloper. The sisters are a great partnership and bounce ideas off each other to ensure the stable is running as efficiently as possible and continuing to strive for the best. Eligible for BOBS Bonus Scheme, $8 million Inglis Race Series, $3.5 million Golden Slipper, $2 million Inglis Millennium race, $1 million Golden Rose, $1 million Inglis Sprint. 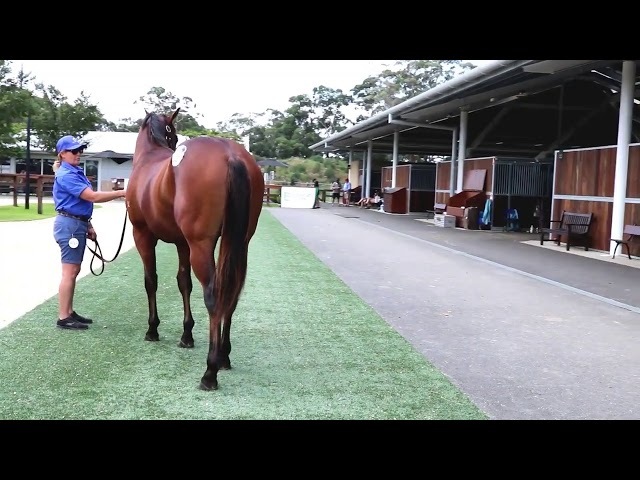 SHARE PRICE INCLUDES - Purchase Price, Breaking, Insurance to 01/03/2020, BOBS Bonus scheme, Nomination for the Inglis Race Series, Golden Slipper and Golden Rose, Agistment, Pre-Training, Floating, Vets and all other associated costs to 1st May 2019. FIXED FLAT FEE of $90.00 per month per 2.5% ongoing upkeep expenses. YOUR SONG (AUS) (Brown 2009-Stud 2013). 3 wins-2 at 2-to 1400m, BRC BTC Cup, Gr.1. Sire of 152 rnrs, 92 wnrs, inc. SW Gem Song (ATC Eskimo Prince S., Gr.3), Brave Song, Split Lip, SP Memento, The Tenor, Soundcheck, Peristrophe and of Ceol Na Mara, Hold the Line, Only Wanna Sing, Bold Kingston, Envy of All, Miss Exfactor, Mister Songman, Setoga, Tabbing, Craig's Star, Golden Halo, Hollaback Girl, Cedarwood, Devolving, French Tune, etc. BREVITY, by Bernardini (USA). Winner at 1600m in Aust. This is her first live foal. Sacred Surfer. 2 wins at 1200m to 2019 in NZ and Malaysia, 2d Hawkes Bay Mardigras Event Hire H., Singapore TC Better Than Ever S., 3d ARC Cardinal Logistics H., Singapore TC Abundance S., Class 4 H.-twice. Missile Attack. 2 wins at 1700m in 2018-19 in Aust. Rose Darmore (f More Than Ready) Winner. See above. Woodala (f Woodman) 6 wins from 1400m to 2400m, A$186,800, Northam Cup, WATC Astralander H., Bold Conqueror H., Quanah Park Afleetaffair H., 2d WATC Ascot Gold Cup, L, 3d WATC Baileys Mint Chocolate H., D'Orsogna Italian Festival Trophy H., AJC Chris Lean H., WATC Petola H., 4th WATC Farnley S., L. Producer. Tate Modern. 5 wins from 1600m to 3000m, MVRC Timbercorp P., 3d SAJC Cleanevent H.
Eureka Dazzler. 2 wins at 1200m, 1300m, BRC Timeform P., 2d BRC Channel Seven H., 3d BRC Hidden Dragon at Lyndhurst P.
Redhaze. Winner at 1300m in 2017-18, 3d Ipswich TC Grandview Stud H.
MAJESTICALLY (g Maroof) 10 wins-2 at 2-from 1100m to 2400m, A$677,593, AJC Summer Cup, Gr.3, STC Frank Underwood Cup, L, Lord Mayor's Cup, L, Stayers' Cup, L, AJC De Bortoli Wines H., STC Star City Welter H., 2d STC Todman Slipper Trial S., Gr.2, NE Manion Cup, Gr.3, Clarence River JC Grafton Cup, Gr.3, AJC Australia Day Cup, L, STC Stayers' Cup, L, Christmas Cup, L, WJ McKell Cup, L-twice, Murrumbidgee TC Wagga Gold Cup, L, 3d STC Winter Cup, L.
Rose Beat (f Rhythm) 3 wins to 1400m, A$80,490, VATC Allan Wicks H., SAJC Jayco Caravans H., Christmas Twilight H., 2d VATC Chisholm P., 3d VATC Lord S., L. Producer. Darmala (f Danehill) 2 wins. See above. DEMERGER (f Saithor) 8 wins-2 at 2-from 1400m to 3200m, A$997,250, SAJC Adelaide Cup, Gr.1, VRC Matriarch S., Gr.3, Queen's Cup, Gr.3, Dover P., Bounty Hawk H., Scomeld H., MRC April 2YO H., Highways Tabaret 2YO H., 2d Moonee Valley Oaks, Gr.2, SAJC Carlton Draught S., Gr.3, VRC Beachside H., MRC Wood Court Inn H., 3d MRC Angus Armanasco S., Gr.2, VRC Let's Elope S., L, Ballarat Cup, L, VRC RSL H., 4th AJC Australian Oaks, Gr.1, VRC AV Kewney S., Gr.2, Rose of Kingston S., Gr.3. Producer. IMPETUOUS (f Fastnet Rock) 3 wins at 1350m, A$124,950, Wyong RC Mona Lisa S., L, 4th Scone RC Inglis Guineas, RL. Producer. ROYAL RADA (g Haradasun) 10 wins-1 at 2-to 1400m, A$250,015, Kalgoorlie Boulder RC Hannan's H., L.